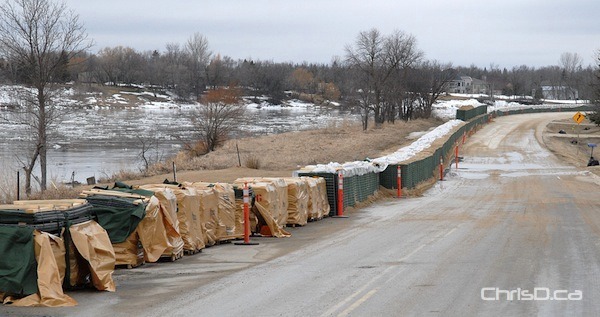 The province will begin operating the Red River Floodway gates at 9 a.m. on Saturday to divert more river water around Winnipeg. During an afternoon media briefing, officials with Manitoba Water Stewardship said the gates would be raised to allow for water south of the floodway inlet to remain at natural levels. Rain received this weekend could account for 10 to 20 millimetres of precipitation in the Red River basin. Plans are currently being made to close Highway 75 in the next two to four days, shutting down the northbound lanes near Morris first. Valley communities are also battening down, partially closing ring dikes and blocking bridges to motorists. A partial closure at the Brunkild ring dike is complete, officials noted. By Friday afternoon, the Red River in Winnipeg sat at 19.7 feet James. Up to 350 sandbagging volunteers are still needed to assist property owners build up dikes by Sunday. Call 311 to give your availability and be assigned to a property in need.